Learning how to register a domain name saves you money, and gives you more control over your online presence. Are you ready to take the next step in your business or personal career? If you are looking forward to taking your brand image to the next level, getting a website online will be one of the keys to your success. In 2019 online consumers are expected to have an even more significant impact on the market than they did in a record-breaking 2018. There has never been a better way to gain exposure, get free traffic, and truly develop a community environment with your customer base. To begin the journey of developing an impressive online presence, the first thing to do is to register your domain name. What Makes Up A Domain Name? 1. The Website Name – Your domain name is the portion of “https://www.yourwebsite.com” that starts after “www.” in your homepage URL. 2. TLD (Top-Level Domain) – TLD’s are the last section of a domain name, most commonly known as .com. 3 (Bonus). URL – A Universal Resource Locator (URL) is a particular web pages web address in its entirety. From example, “https://www.yourwebsite.com” and “https://www.yourwebsite.com/products” are both URL’s that belong to the same domain name. Do you have your name down? Perfect! Now let’s look into going through the process of registering it. This blog is strictly for informational purposes, that means we get no commission, no matter who you register your domain with! The options that we will cover below will be in no particular order, but we invite you to explore each possibility to the fullest. Pricing: Domain names start at just $0.99 for a .com registration for one calendar year. The second year the price jumps to $14.99. It is important to note that the cost of domain names vary by their potential. Seeing domain names for $50,000 and up on any platform is quite a common occurrence. Support: 24-hour customer support available by live chat or phone. Step 1: Head to GoDaddy.com and enter in your ideal domain name. Step 2: Select "Add To Cart" and then immediately select "Added To Cart" or "Continue to Cart." Step 3: You have the option to hide your ICANN registrar information by selecting privacy protection. We highly recommend doing this regardless of who you choose to buy your domain name from. Either select your plan or pick "No Thanks." 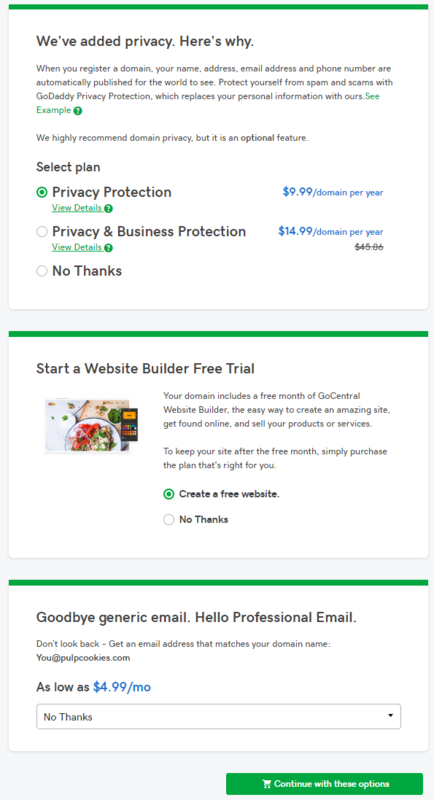 Select "No Thanks" for the free website builder trial, as well as "No Thanks" for the professional email. Click "Continue with these options" when finished. Step 4: Create your free account and complete your purchase! Pricing: At NameCheap, .com domain names are found for an average of $8.88 per year. Like all domain providers, it is important to note that the prices of domain names vary by their potential. We mentioned above that seeing domain names for $50,000 and up is common. The same rule applies here. Support: Although NameCheap does not provide phone support, their live chat and email ticket system run smoothly. Developers also enjoy their Knowledgebase center. The center serves as a comprehensive version of an FAQ section. Step 1: Head to NameCheap.com and enter in your ideal domain name. Step 2: Select "Add To Cart" and then immediately select "View Cart" in the box to the right. Step 3: You again will have the option to hide your ICANN registrar information by selecting privacy protection. After doing this, select "Confirm Order" to proceed to the next step. As the two examples demonstrate, registering a domain is going to be a similar process regardless of the registrar that you use. When it comes to purchasing a domain, the difference in value company-to-company is decided by the add-on’s and hosting options. Because we are not discussing hosting options, the competition between companies is relatively even. With that said, let’s look at the differences that we will find when strictly registering a domain. We covered a few popular domain registrars in the analysis above, but we did not mention the pool of hundreds of others. When you see the volume of registrars, finding one can be intimidating. Below we will cover a few differences that may help guide you when making a choice. 1. Pricing and Contracts: The pricing for a domain from business to business can and often does vary. Although most companies keep the price range in the same ballpark, the opportunity to save money does present itself. When you purchase your domain, you will also have the option of selecting the length of contract. Most deals involve a two-year domain contract, but some registrars allow you to solidify the domain name for 10+ years at a time. 2. Domain Transfers: Domain transfer policy is the area that tends to vary the most from company to company. After registering your domain, expect it to stay in its place for 60 days. After that period, most companies will let you initiate a transfer. Depending on the business, a fee may be associated with the transfer request. If you are a business owner that does not have a background in web development or hosting services, we suggest sticking to registrars with customer support teams that are available by phone. The biggest hurdle when registering a new domain is the terminology and contractual language that comes with the territory. A good customer support team can make this transition easier. Getting your website online is one of the most exciting parts of being a business owner. Your site speaks for your professionalism and willingness to deliver excellent customer service. We hope this guide helps you complete step one of your multi-layered journey.